Want to Learn Hebrew? Try Ulpan. This is an active, hands-on approach towards basic conversational Hebrew, reading and writing. 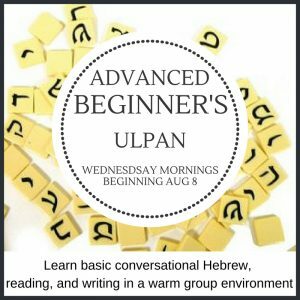 We learn slang, listen to songs and dialogues, study texts, and play games in Hebrew. Classes will take place on Wednesdays (10:30 am to 12:00 pm) on 8/8, 8/15, 8/22, 8/29, 9/5, 9/12, 9/26, and 10/3. $260/members, $280/non-members. Call the office 718.338.3800 or email office@emjc.org for more information. To purchase your tickets via credit card, visit our Square store: https://squareup.com/store/emjc or bring cash or a check to EMJC on the date of your class.